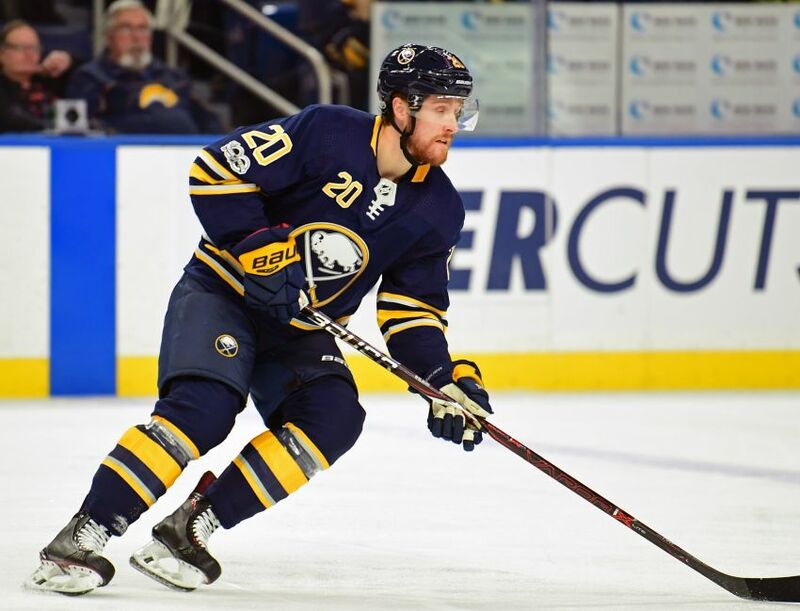 BUFFALO – Sabres winger Scott Wilson spent three full seasons in the Pittsburgh organization, morphing from a seventh-round pick into a regular on the Penguins’ 2017 Stanley Cup championship team. Wilson made 98 total appearances last season, including 20 in the playoffs. On June 11, the winger skated more than 13 minutes in Pittsburgh’s Cup-clinching victory. But by October, Wilson’s days with the Penguins were numbered. They needed centers and had too many wingers. Wilson often sat out as a healthy scratch. On Oct. 21, the Penguins traded Wilson to the Detroit Red Wings for center Riley Sheahan. Wilson played 17 games before the Red Wings dished him here Dec. 4 for a 2019 fifth-round pick. So Wilson, 25, played for three teams over a wild 44-day stretch. “It’s been pretty stressful, just moving around, finding places to live and meeting new people all the time,” Wilson said Sunday inside KeyBank Center. “It’s been a long couple of months. Even from the start of the year it’s been pretty long. While the 5-foot-11, 183-pound Wilson sat out Tuesday’s 3-0 loss to the Boston Bruins, he skated among the regular forwards Wednesday, meaning he should return soon. On a struggling team lacking depth and experience, the speedy Wilson has been a nice addition for the Sabres’ third or fourth line. They’re 2-1-3 with him in the lineup. He sat Tuesday because center Jacob Josefson returned from an ankle injury. Wilson knows Sabres general manager Jason Botterill well from their days together in Pittsburgh. Botterill ran the Penguins’ AHL affiliate in Wilkes-Barre/Scranton and watched Wilson develop up close. Wilson is also close with Sabres forward Evan Rodrigues, his teammate in the Ontario Junior Hockey League. Sure, moving around can be difficult, but on the other hand, Wilson has also been wanted by NHL teams. Leaving Detroit wasn’t hard, Wilson said. However, saying goodbye to Pittsburgh was “tough,” Wilson said. Still, he understood if he wanted to further his career, it was best to leave. Wilson earned NHL playing time in 2016-17 because he said he found his “identity.” After leaving UMass Lowell following his junior season, Wilson, like a lot of solid prospects, started piling up points in the AHL. The fact that Jordan Nolan is in the lineup over Scott Wilson is a joke…that shouldn’t be a hard decision for Housley.